When is a recipe not a recipe? Sometimes you throw something together when you’re not paying much attention and it ends up being something you want to recreate and share! 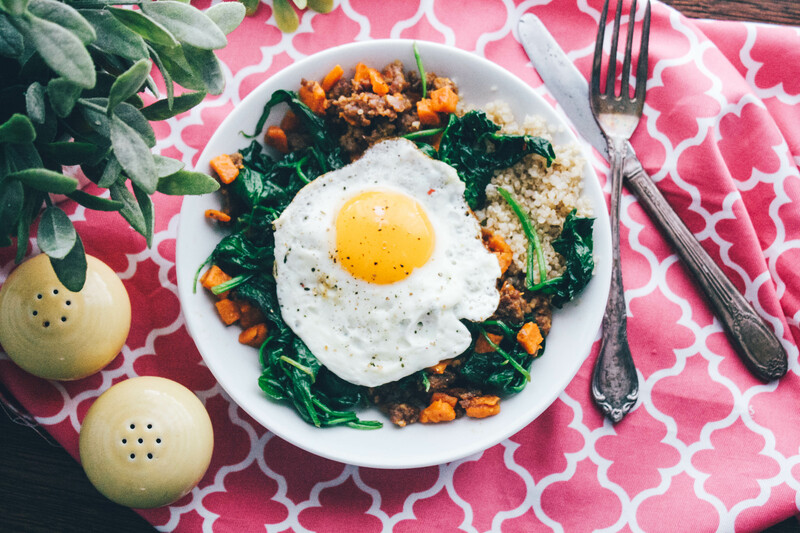 That’s what happened with my Sausage, Sweet Potato & Spinach Quinoa Bowls with Egg. I came up with these bowls recently as I was trying to make something for breakfast using leftovers. I had made a batch of quinoa at the beginning of the week and had a good amount ready to be used for something tasty. 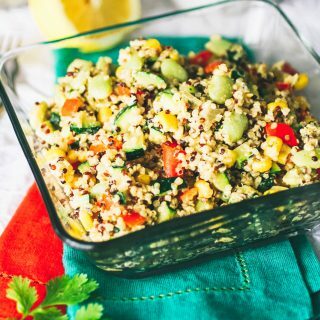 I can’t seem to go wrong with quinoa: it’s low in calories and fat, high in protein, vitamins and minerals, and has a bunch of other benefits, too. It’s also a naturally gluten-free food, and soooo versatile. 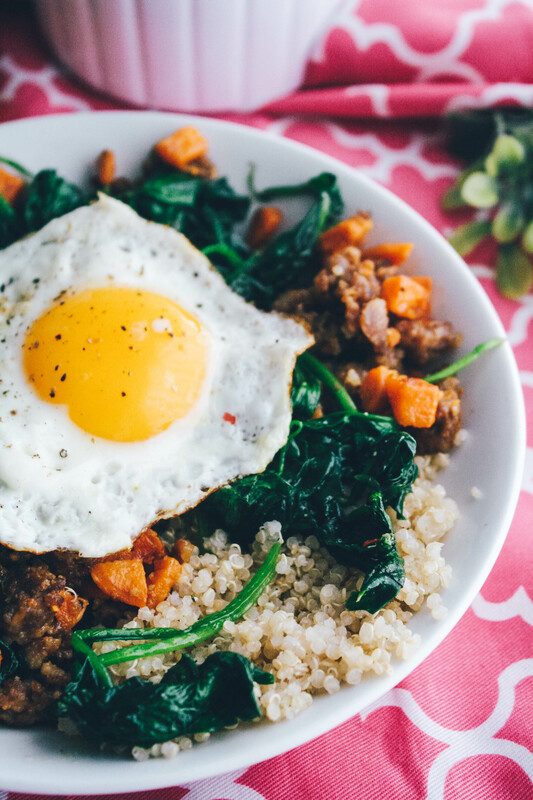 Quinoa is perfect for a lot of dishes, like this simple and warming breakfast dish of Creamy Breakfast Quinoa with Roasted Butternut Squash. You might not think to eat butternut squash for breakfast, but try it! I bet you’ll love it! If you like more traditional dishes for breakfast, check out these Blueberry Banana Walnut Smoothie Bowls — mmm! 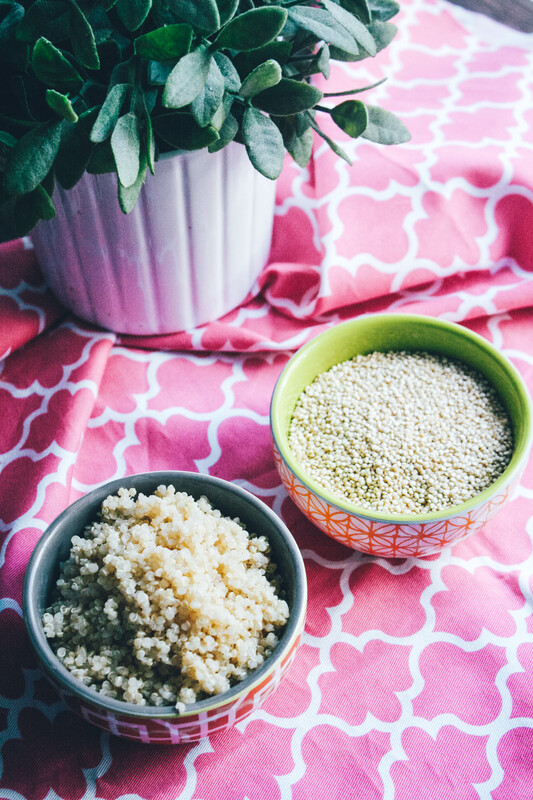 Maybe you prefer your quinoa mixed up with a salad like Kale and Quinoa Salad with Honey-Dijon Dressing. It’s so hearty and good for you! And these Quinoa, Coconut and Date Muffins are perfect for a snack, or with your morning coffee! These bowls are perfect around the holidays, too. If you’re like me sweet potatoes and sausage are usually always on hand. 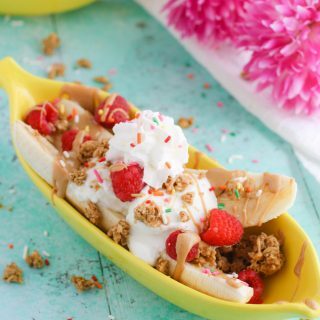 Imagine your holiday guests waking up to these delicious bowls (and how easy they are to make)! 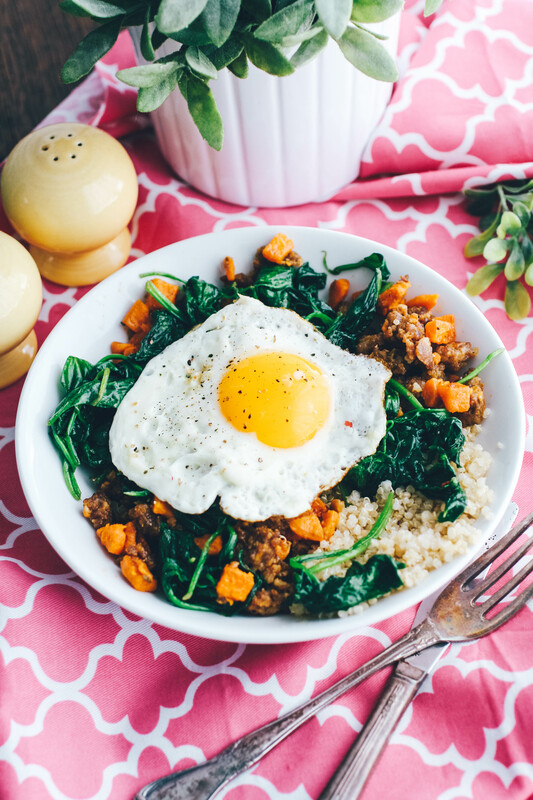 I really like the egg part of these Sausage, Sweet Potato & Spinach Quinoa Bowls with Egg! Whether you like your eggs runny or over hard, the egg adds extra protein and heartiness. I love these for breakfast, but you could even serve these bowls for dinner! 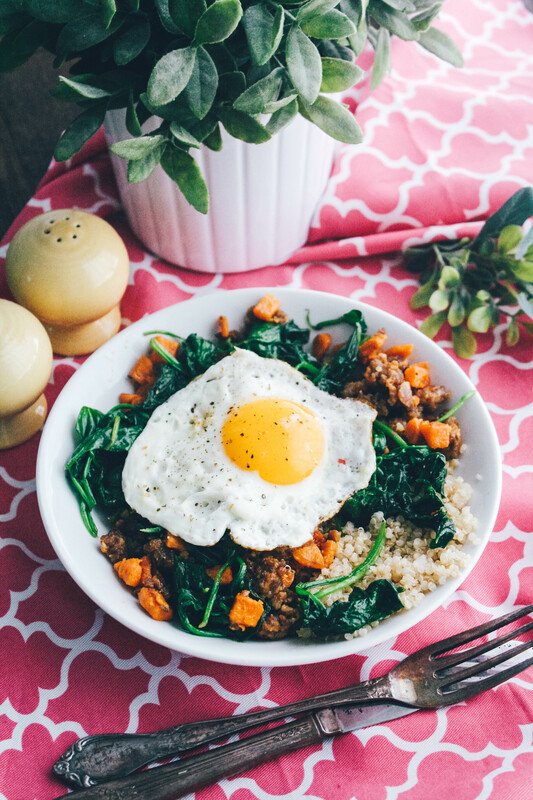 If you like recipes that aren’t really recipes, but more like, “I’m going to toss these goodies together and see what happens” then these Sausage, Sweet Potato & Spinach Quinoa Bowls with Egg are for you. 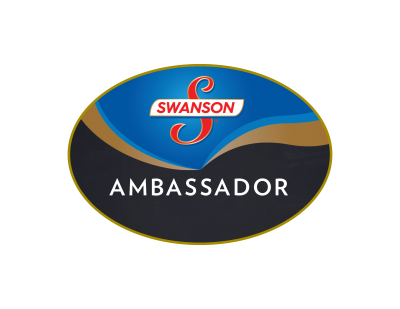 Try them soon! Preheat the oven to 375 degrees F. Toss the sweet potatoes with the oil and season with the salt and black pepper. Cook, tossing once or twice, for 25-30 minutes or until soft (I like to cook extra than what the recipe calls for and save the leftovers for another dish). Cook the quinoa according to the package directions (you’ll likely have extra, save it for another dish). Set aside. Add the sausage to a large skillet and cook until it’s browned and cooked through. Turn off the heat and add the spinach to the sausage. Toss to combine. The spinach will wilt. Remove from the heat. 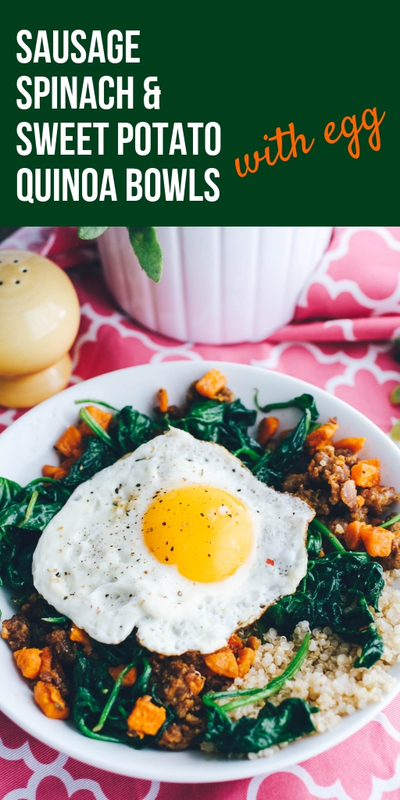 Toss together the sausage and spinach, sweet potato, and 2 cups cooked quinoa. Cook eggs to suit your taste and top each bowl with one egg. Season the eggs with a bit of salt and pepper. Yummy! This is a perfect bowl of some of my favorite foods. OMG this looks so good!! I haven't had anything to eat all day and i wish i could just grab this dish right from the comp! This is my go-to type dish any time I get to have dinner on my own or want a hearty breakfast or lunch. I adore this combo! 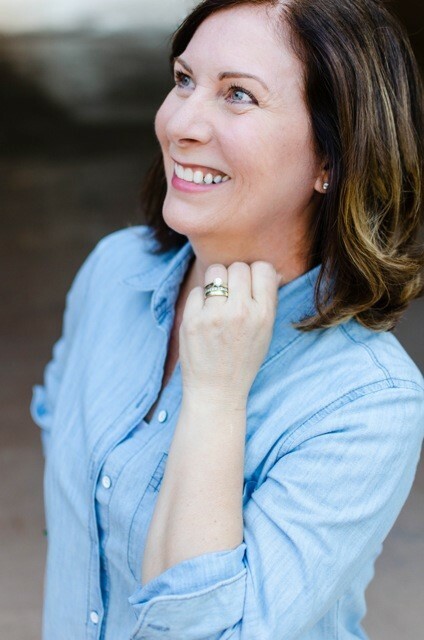 Thanks, Jen! Yes, I love these types of meals, too! 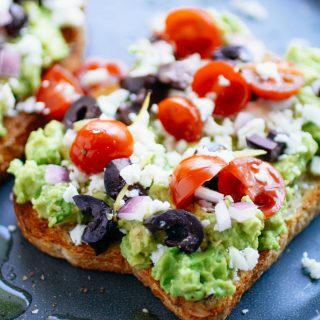 This looks like a filling and good for you breakfast or lunch option. I use a lot of sweet potatoes this time of year, but wouldn't have thought to use them with quinoa. Great idea! Easy to make and delicious, leftovers kept well, I have a microwave egg poacher that I used to make another fresh egg to top the dish again for an enjoyable lunch at work the next day. That's a great idea! Thanks for stopping by, Richard! I actually had something similar to this for lunch today! It lolks delicious!